Bio-Rad's 1000-series thermal cyclers offer superior performance in a flexible and fully modular platform. 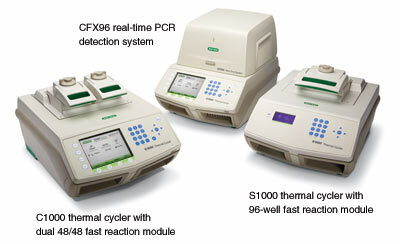 Choose the full-featured C1000 cycler, the basic S1000 cycler, or a combination of both. Accommodate different throughput needs with easily interchangeable reaction modules that swap in seconds without requiring tools: The four reaction modules include a gradient-enabled 96-well fast module, a gradient-enabled dual 48-well fast module that allows two independently controlled protocols to be run side-by-side in a single bay, a 384-well module for high throughput, and a CFX96 optical reaction module with five-target real-time PCR capabilities. Each PCR module has a fully adjustable lid that supports a wide range of vessels and sealers, including low-profile and standard-height plates. The overall run time of a PCR reaction depends on protocol design, enzyme type, and the thermal capabilities of the thermal cycler. 1000-series thermal cyclers deliver premium thermal performance for reproducible results and fast run times. The time to reach target temperature, which comprises the average ramp rate and the settling time (the time it takes to reach thermal uniformity), is the key factor determining how fast a thermal cycler can run a given PCR protocol. Average ramp rate is a better indicator of a cycler’s capabilities than maximum ramp rate because the latter is generally not maintained throughout a temperature step. The average ramp rate of 1000-series cyclers, combined with a 10-second settling time, allows fast run times while maintaining excellent thermal accuracy and uniformity. Rapid arrival at target temperature and superior uniformity. 1000-series thermal cyclers exhibit high average ramp rates, rapid settling time, and tight thermal uniformity throughout the ramp. This graph shows the temperature measured by probes in 15 wells across a sample block. The traces are nearly indistinguishable due to the tight uniformity. Note the consistent ramp rate throughout heating and cooling.